Learn to make a quilt from beginning to end in this comprehensive course. 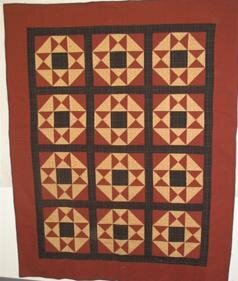 Students will work on a star wall hanging while learning the process of quiltmaking. We've broken the sessons down into two sections to allow you enough time to get your homework done! Section #1 -- This three-week class covers the basics of designing and drafting a quilt, color, fabric selection, and machine piecing. SUPPLY LIST -- Bring a pencil and notebook to the first class. Online sign-up is not available if you are using your Class Pass. Please register in the store.